The list of milestones is long! Washington Bikes couldn’t make any of this happen without the support of people like you: People who care about safer streets, better bike networks, bike-friendly towns, and laws that improve education, safety, health, justice, and our local and state economies through biking. Reason #1 bicycling in WA awesome: 7th yr @bikeleague says WA #1 Bicycle Friendly State. For the seventh year in a row the League of American Bicyclists named Washington the #1 Bicycle Friendly State in America. 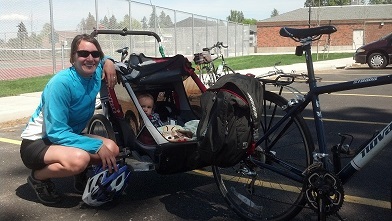 Reason #2 biking in WA great: @peopleforbikes says we have 2 of US’s 10 best new bike lanes. Protected two-way bike lanes grew, with two in Seattle named among America’s 10 best new bike lanes by People for Bikes. New approaches to infrastructure get more people riding, and with examples on the ground we can expect more cities to build these. 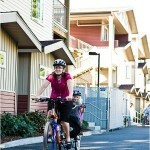 Reason #3 biking in WA fantastic: Bicycle-Friendly Communities like Wenatchee. The Greater Wenatchee Metropolitan Area became the state’s first multiple-jurisdiction Bicycle-Friendly Community. 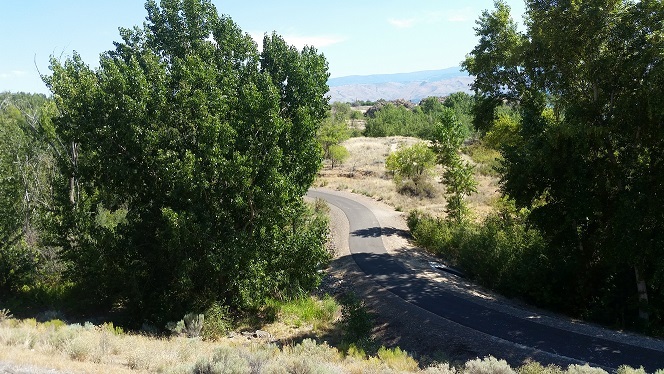 The application included Wenatchee, East Wenatchee, Rock City, Chelan County, and Douglas County, and was energized by the efforts of Wenatchee Valley Velo Club and area trail groups, among others. For a complete list of Washington state’s Bicycle-Friendly Communities, Businesses, and Universities from Sequim to Seattle to Spokane, see our Bike-Friendly Washington page. To get your community on the list, start working on your application first thing in the New Year: Next round of applications due Feb. 11, 2015. Apple Capital Loop Trail, East Wenatchee. Reason #4 WA biking great: Small towns, breweries, scenery, local food–WA bike touring rocks! We celebrated the release of Cycling Sojourner: A Guide to the Best Multi-Day Bike Tours in Washington. Around 3,000 copies are already in circulation to get more people exploring Washington by bike with the first multi-day bike tour guide for Washington to come out in over a decade. One of the mountain views you’ll find (earn!) if you ride the tours in Cycling Sojourner Washington. 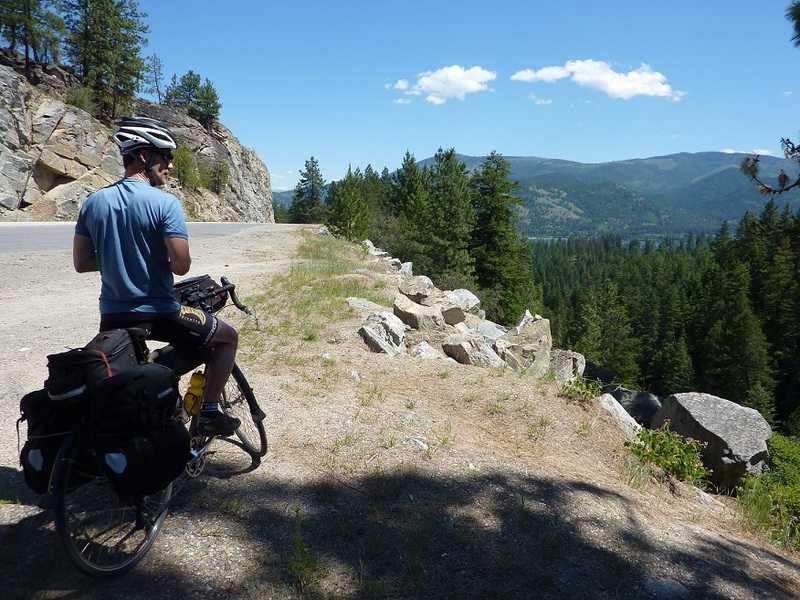 Reason #5 WA biking rocks: 1st @usbicycleroutes on West Coast, USBR10. Put it on #bikeit list! Working with WSDOT, WA Bikes rolled out US Bicycle Route 10, our state’s first entry in the US Bicycle Route System (a nationally recognized interstate bike network), with a ribbon-cutting featuring State Transportation Secretary Lynn Peterson. USBR 10 is the first US Bicycle Route in the Pacific Northwest and on the West Coast. Anacortes Mayor Laurie Gere and WSDOT Sec. 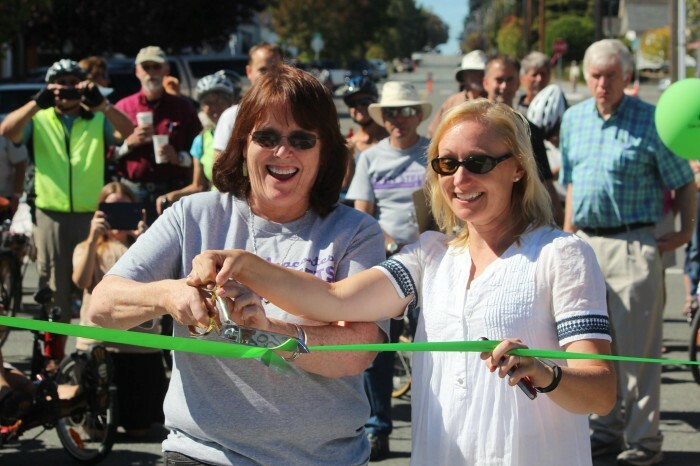 Lynn Peterson cut the ribbon in Anacortes for USBR10. We trained teachers in 8 new school districts to use our Bike and Pedestrian Safety Education Program: Cascade (Leavenworth), Deer Park, Kettle Falls, La Center, La Conner, Newport, Riverside and Tumwater. Over 56,000 students have learned to bike and walk to school safely and responsibly with our program, with 15,000-16,000 more each year. 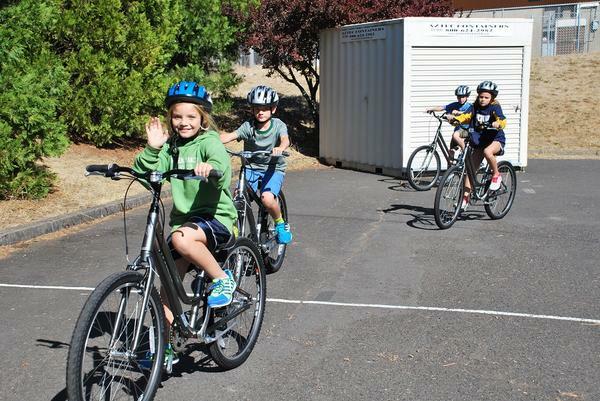 The program is supported by WSDOT and involves the Office of Superintendent of Public Instruction — biking to school is healthy transportation and good for waking up brain cells and preparing kids to concentrate and learn. Children in White Salmon enjoying the bikes they got through the Safe Routes Bicycling/Walking Safety Education Program run by Washington Bikes with funding through the Dept. of Transportation. Photo by Amber Marra, White Salmon Enterprise. WA Bikes partnered with Snohomish County, the Centennial Trail Coalition, and others to rally support for the 27-mile Whitehorse Trail connecting Arlington to Darrington through the stunning Stillaguamish Valley. The trail and the tourists it will attract will aid the region’s recovery from the devastating Oso mudslide. Reason #7 biking in WA=fantastic: trails like Whitehorse & Centennial. Reason #8 WA biking great: 1000+ @railstotrails miles–most in the US! 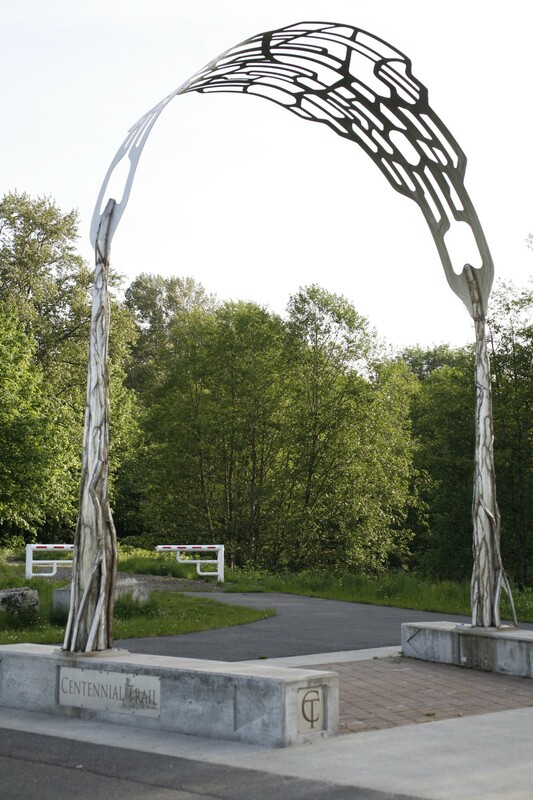 When the Whitehorse Trail is completed it will connect to the Snohomish County Centennial Trail. From there, a growing network of trails connects the Puget Sound region. The Cross-Kirkland Corridor, part of the Eastside Rail Corridor; Burke-Gilman Trail; East Lake Sammamish Trail; Interurban; Ship Canal; trail mileage continues to grow, inviting more and more people to ride to more places. With over 1,000 miles of rail-trails, Washington is #1 in the nation for rail-trail miles and has the single longest such trail, the John Wayne Pioneer Trail. Trail projects keep rolling, from the Prairie Line Trail in Tacoma to the final “Bridging the Gap” project in the Chehalis-Western Trail to the Olympic Discovery Trail. 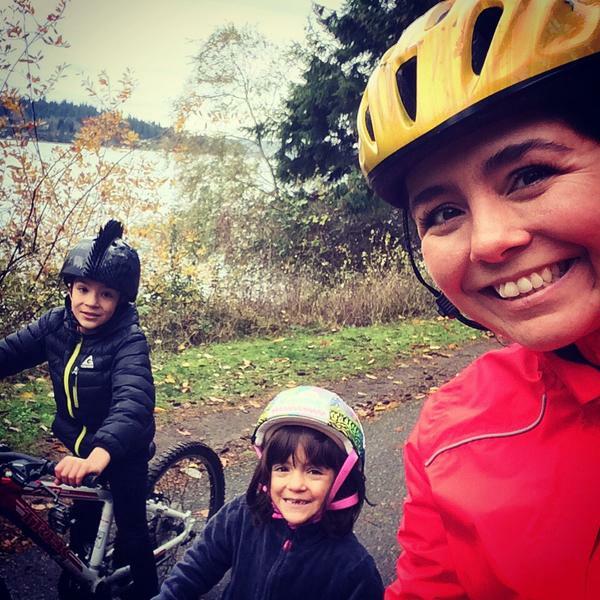 Reason #9 WA biking rocks: Local advocates who show up, speak up, ride the talk. With support from Empire Health Foundation, Washington Bikes opened an office in Spokane. We tripled the number of League of American Bicyclists Certified Instructors in the Inland Northwest by hosting a training, developed a network of PE teachers who collaborate to get kids biking, and piloted a Walking School Bus program (since kids walk before they ride) that will continue under the auspices of the Spokane Regional Health District. 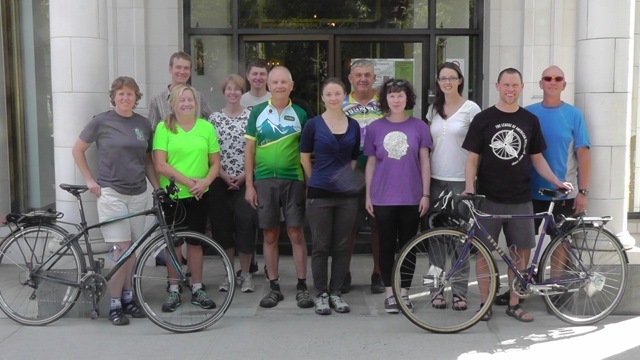 Local advocates including members of Spokane Bicycle Club, Belles and Baskets, Swamp Ride, and others volunteer in our programs and with all the great bike events in the area. WA Bikes (then the Bicycle Alliance) helped found Bike to Work Spokane in 2007; advocacy in the region has grown steadily ever since. Around Washington in 2014 more and more local people became bike leaders. Seattle, Kirkland, and elsewhere: Activists started pushing for Vision Zero traffic safety measures to reduce fatalities to zero for pedestrians and bicyclists. Wenatchee: Advocates energized the effort to get elected officials from five jurisdictions on board for the Bicycle-Friendly Community application and are working for the “Fruit Loop,” a proposed link between Wenatchee and Leavenworth. Port Angeles and Clallam County: A similar effort is under way for Bicycle Friendly status, with Port Angeles Likes Bikes bringing people together. Vancouver: BikeVanWa advocates for completion of critical trail segments and on-street improvements. Pullman: Advocates are hard at work on a number of fronts. They got Pullman added to the statewide bike count, got the city to support installation of bike racks around downtown and identified the best locations, and worked to keep the possibility of a rail-trail between Colfax and Pullman alive. LCI Seminar in Spokane, August 2014. 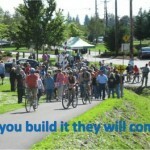 Reason #10 biking in WA keeps getting better: Elected officials at all levels who get it. Congressman Rick Larsen, who supports the Guemes Channel Trail and asked the GAO to conduct a study of highway engineering standards and how they affect people who bike and walk. Again, the list goes on. Bike-friendly policy is bike-partisan! Reason #11 biking keeps getting better in WA: Open Streets parties take over our streets! Open Streets events based on the original Ciclovia in Bogotá, Colombia empower people to experience their streets in a whole new way: without cars! Once people have felt that freedom, they see the possibilities of the street with new eyes. These events can inspire people to work for redesign and other changes to make streets friendlier for all. Spokane Summer Parkways, put on by volunteers with the SpokeFest Association, has run for several years. In Tacoma, car-free Sundas on Five Mile Drive take place year round along with the annual Downtown to Defiance Open Streets celebration. In 2014 Anacortes held its first-ever Open Streets event. Does your community hold an Open Streets event? Note it in the comments below and we’ll add it to the list here. Want to start an Open Streets event? Check out the Open Streets guide brought out by the Alliance for Biking and Walking and NACTO (PDF). Reason #12 WA bikes: Fun challenges from #coffeeneuring to #biketowork to #30daysofbiking. 30 Days of Biking: Simple, really — just ride your bike every day. Every. Single. Day. Takes place in April and again in September. #Coffeeneuring: Ride 7 places in 7 weeks for coffee. Quite a few Washington riders went for coffee–imagine that! Bike to Work Week: From Olympia (where Thurston County has the longest-running commute challenge in the state) to Spokane and everywhere in between, people rallied their coworkers. Check out some of the winning categories in the giant Commute Challenge put on by Cascade Bicycle Club — good thing participation in this workplace challenge is so big, considering that the Puget Sound is home to over half the entire state’s workforce. If your area has a Commute Challenge that isn’t on our list, let us know. National Bike Challenge: This gets bigger and better every year. Miles per capita measures let people in really tiny places (Dixie, WA, we’re looking at you!) match their mileage of all kinds against the big cities. All kinds of riding count and you can log miles May-September. Solstice Ride: Among those out on their bikes on the shortest day of the year — Seattle Randonneurs and Tacoma Kidical Mass. Did you go for a ride to chase the sun back into the sky? Local challenges: In 2014 City of Spokane staff created the “Commute of the Century” — 5 maps of 20-mile routes designed to have people ride in every quadrant of the city and provide input on conditions for bicycling. Promoted as a series of lunchtime rides during Bike to Work Week, the challenge is available any time you want to download a map. 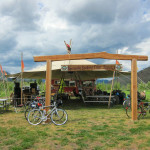 In Wenatchee the Pybus Kids Century challenged kids to ride the 10-mile Apple Capital Loop Trail to rack up the miles. Did your town or group put on a creative local challenge that isn’t about biking to work? Will you be repeating it in 2015? Mom and baby take a break for snacks during Spokane’s Commute of the Century. Reason #13 we love biking WA: Recognized as part of huge outdoor rec economy in the state…. In 2014 Gov. Jay Inslee appointed a Blue Ribbon Task Force on Parks and Outdoor Recreation. The outdoor recreation economy in the state is worth over $20 billion (that’s with a B) and puts 226,000 or so people to work all over the state. With strong support for trails expressed at every meeting, the task force recommendations that Washington Bikes will be supporting include funding for the Washington Wildlife and Recreation Program. Bicycling contributes to the state’s economy: We have major bicycle manufacturing and supply companies headquartered here, retail sales, bicycle tour guides, and every form of riding from bike touring to mountain biking to major events, charity rides, day trips, and biking downtown for coffee. Bonus support for bicycling in 2014: We celebrated record-breaking attendance for this year’s Annual Auction and Gala! Thank you to our sponsors and organizational members: Cascade Bicycle Club, John Duggan Cycling Attorney, Ortlieb, SvR Design, Sound Transit, UW Transportation Services,Biking Billboards, Zipcar Seattle, Todd Vogel and Karen Hust, House Wine, Schooner Exact Brewing Co., DRY Soda Co., Foro Tasto Design, and H4 Consulting. The funds we raise through the auction help support our lobbying in Olympia and our policy work with state, regional, and local agencies. If you’d like to make a tax-deductible donation to support our work for better bicycling all across the state, use our online form. You’ll help us make next year’s list of milestones even longer. Be part of the success: Sign up for our e-news to learn what’s happening for better bicycling, events in your area, legislative action and more. This article was posted in Auction, Bike to Work, Chelan County, Economic Impact, Education, Encouragement, Events, Funding/Policy, Infrastructure, Issues & Advocacy, Kids, King County, News, Olympia, Olympic Peninsula, Safe Routes to School, Snohomish County, Spokane County, Tacoma, Thurston County, Tourism, Trails, Travel, USBRS, Vancouver, Wenatchee, White Salmon. Bookmark the permalink. Follow comments with the RSS feed for this post. Both comments and trackbacks are closed.